9 Tips How to Make Your Computer Silent That Will Actually Works! Blog 9 Tips to Have a Silent Computer That Works! More Than Just Quiet Computer Fans! 9 Tips to Have a Silent Computer That Works! More Than Just Quiet Computer Fans! Im sure you know as well as I do how annoying a desktop tower can sound when it is running at full capacity. Sometimes it’s not that it’s loud, but it’s because of the high pitch winding noise that comes out of the computer. There are ways to soundproof your desktop computer, and you can also go the DIY route and make a complete silent pc build. It might not be entirely soundproof, but you sure can do things to make your desktop computer much quieter. Here are our Top 10 Tips to get that silent gaming experience. Or at least have a quiet computer in your home office. The first and one of the essential noise reduction aspect is cleanliness. A clean PC is usually a quiet PC. I’m obviously talking about the literal aspect of cleanliness and not file dumping. Open up your PC tower a couple of times a year and vacuum the inside. It only takes a few minutes to do, and you would be surprised as to how much dust can accumulate inside a computer. The amount of cable clutter within your computer tower doesn’t have much of an influence on temperature but it does have an influence when it comes to noise. Fewer cables you freely have inside your computer casing the less turbulence you will have and the quieter your computer will become. If you do have a lot of cables inside your computer casing, use plastic zip ties to wrap them together so they’re not cluttering the inside of your computer. 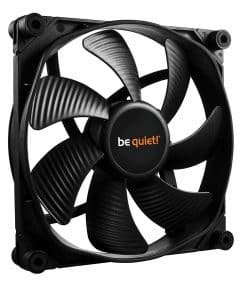 BeQuiet Silent Wings 3 Cooling Fan. Most of the noise can come directly from your cooling system. It’s not the fact that you may have too many fans but you might not have the right type of fans to make your computer silent. You can buy quiet PC fans for a lot less money than you might expect! The best quiet computer fan we tested is the “BeQuiet Silent Wings 3 Cooling Fan”. These cheap, quiet PC fans are usually around 25 dollars. You can certainly buy a more expensive quiet computer fan, but the BeQuiet Silent Wings 3 is all you need! At low speed, the BeQuiet Silent Wings 3 is nearly silent. When at high speed, they’re making a tiny bit of noise but far from your typical computer cooling fans. Doing 1600 RPM on a 140mm fan is obviously going to make “some” noise; I can only compare this cooling fan to the Noctua fans on my CPU cooler, and those do seem louder at max, and they spin 100 RPM slower. What this fan does very well is avoiding making mechanical and electrical noise, even at moderate speeds. It’s mostly just the winding noise of air until you get closer to max speed. My other fans produce a mild hum when running at moderate speed. The air winding noise does seem a bit lower pitched as well, and that’s exactly what I look for in a cooling fan. Another thing to point out is that the frame has a rubber coating for maximum sound absorption. Click here for the current Amazon Price for this cooling fan. Cooling is a struggle between temperature and noise. If you can manage to keep your PC cool, then you should have less noise in return. People often make the mistake of running as many fans as they can cram into their system. The key here is to find the right balance between the number of fans and the speeds they have to run to keep your computer tower from overheating. To achieve this, you can either spend big money on expensive fans or be clever with the gear that you have. The air that your cooling fans are producing must have a clear path to leave the interior of your computer. Try to set up your fans so that all air moves in a straight line. Bottom to top, front to back or even inverted versions can also work; as long you don’t have opposing fans or obstructions to the flow. The smoother the air flows, the less hard your cooling fans need to work, and the quieter your computer system will be. Most motherboards, graphics cards and even the computer casing itself have fan controls. You might not know this, but you can make changes to your fan controls, so they work more efficiently. Go into your BIOS or GPU software and create a custom profile. Some PC components can raise the level of heat within your computer. Make a profile that uses minimal fan speed while your computer is idling. I have to admit, I have no clue what so ever how to configure the way your fan operates. But our friends at How-To-Geek can certainly show you how. Follow this link find out how to auto-control your PC’s fans for cool and quiet operation. Other than fans, your PC can have many moving parts like hard drives and optical drives. Make sure these two particular pieces of hardware are not spinning when you’re not using them. It’s not a bad idea to auto set your hard drive into sleep mode when it’s not in use for a predetermined amount of time. Go to your control panel and select the “energy settings” option and you should be able to find what you’re looking for in there. You can avoid those annoying optical cd/DVD drive spin-ups by ejecting the disk. Removing the optical drive altogether is not a bad idea either because speaking for myself, I hardly ever have the optical drive in use. Buying an external optical drive could solve that problem by only connecting it when you need to use it. Where you keep your computer can have a great impact on perceived noise. Make sure intakes and exhaust are completely unobstructed. Move the computer system as far away from where you’re desk chair. Unless you want to show off your computer of course. The thicker and stronger your computer casing is the quieter it should be. 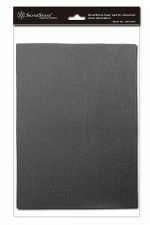 Avoid rattling plastic panels or cases with ultra-thin metal panels. I did find some computer cases made of very thick steel that are quieter than cases with pre-installed sound deadening features. It all depends how much you’re willing to spend on a computer case. I have a PC case with thick sound deadening material inside it, and I do find that there is a difference between the computer I have now and the one I had in my previous casing regarding soundproofing. 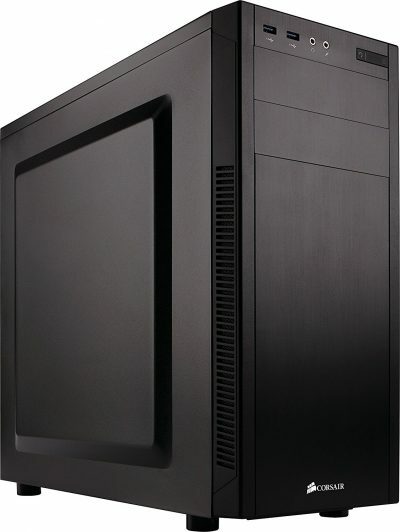 The Corsair Carbide Series 100R Silent Edition (Amazon Link) is the computer case I would recommend if you don’t want to spend hundreds of dollars for a computer casing. Corsair’s Silent Edition is the best value for what you’re getting regarding a premade sound deadening computer case. It comes with sound dampening side panels and a 3-speed fan controller. The fans can power up on overdrive only when performance requires it. This computer case also comes equipped with two silent fans. My only problem with this case is the power light is brighter than a freaking lighthouse! If you keep your computer in a bedroom, then you can simply turn that light off permanently by disconnecting the LED wires. SilverStone 1″ X 15″ 4mm Thick sound-dampening acoustic silent foam on the inside of your PC panels. That will certainly help silent your computer. If your quiet computer fan comes with vibration canceling rings or mounts, use them. The same goes for installing the power supplies and hard drives. If your computer casing does not come with these types of rubber washers; Why no make some yourself from a rubber sheet or even from an old mouse pad. You can also buy some cheap rubber rings and washers at your local hardware store. If you know how to underclock your PC, it will have a considerably longer hardware lifespan, reduced heat generation (and hence dissipation), decreased electrical power consumption, increased stability and reduced noise from mechanical cooling parts. If you don’t require the extra speed your computer has in its arsenal; why not lower it down a few notches? Click the link for complete in-depth depth instructions on How to underclock your PC. Underclocking will reduce the overall computers performance. 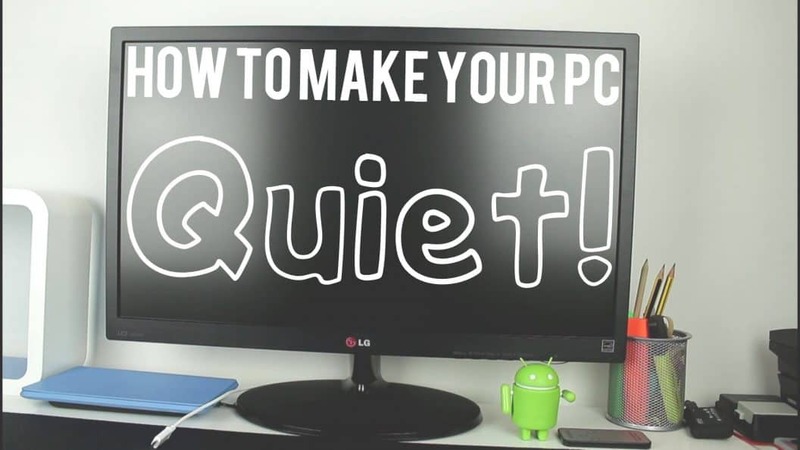 So there you have it, our top 9 tips to make your PC quiet. If you followed most of these steps, your computer should be much quieter and should also consume less electricity and generate less heat. Please let us know in the comment section below if you have additional tips we might have missed. Let us also know if some of these tips helped you out, we love receiving reader feedback.